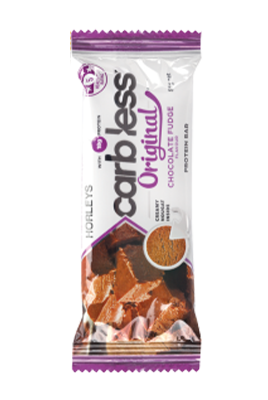 Horleys - Horleys Carb Less Protein Bar - Smart Snacking - The Original Low Carb Protein Bar. The perfect mid morning or mid afternoon snack, or when a chocolate craving strikes! Because these bars are low in carbohydrates, we don't recommend you use them either directly before or after exercise - Protein 33 Bars are more suitable as workout or sports fuel. Please note: due to the fibre and polyol content, excess consumption of Carb Less Bars may have a laxative effective - our suggested maximum intake is two bars per day. *We don't use any ingredients that contain gluten in our Carb Less Original bar recipes. The manufacturing line does also make some products with gluten in them - the chance of cross contamination is very remote however it is not zero. Please contact us if you would like any further information or reassurance on our testing procedures. Foods and snacks that contain protein have a higher satiety, keeping you fuller and more satisfied so you suffer less from cravings. Protein is also metabolically expensive – which means that your body uses more energy to process protein than other macronutrients – making a high protein bar the perfect snack when you’re watching your weight. Carb Less Bars use ingredients such as glycerine, maltitol and polydextrose, which have minimal impact on blood sugars and insulin response. While they are metabolised, they have a relatively low calorific value compared to sugars and other carbohydrates. The total calorie count includes them. Find out more about these low carb ingredients here. Low carb nougat-style protein bars, for satiety and satisfaction. BEST FOR: low-carb diets, weight management and healthy snacking on-the-go. Is Sculpt is a meal replacement? Nutrition for weight loss is really about three things: appetite management, calorie control and healthy snacking. Sculpt has a high protein formula to give you more power to manage appetite and cravings, it’s portion controlled and offers you convenient and versatile options for quick meals and smart snacks. We didn’t create Sculpt as a ‘diet shake’ – our background in nutrition and own philosophy towards weight loss makes us feel that’s a temporary approach and not one that works with a real lifestyle long term. Sculpt is designed to fit into your eating plan, to give you options for eating small, frequent meals that have the power to boost your metabolism. Are any of your products suitable for vegetarians? There are several products in the Horleys range that are vegetarian friendly. Look for 100%Whey, Sculpt, Carb Less Delight, Carb Less Original, Protein 33, and Replace.